The crime of shoplifting is defined as the taking of merchandise offered for sale without paying. According to the National Association for Shoplifting Prevention, more than $35 million worth of merchandise is stolen from retailers each and every day. Shoplifting has become a large part of retail shrinkage. No matter how big or small the retail store may be, all types of retailers are susceptible to the growing problem of shoplifting. This article will help retailers identify shoplifters and shoplifting methods and create a less attractive environment for shoplifters. It will also teach retailers how to implement shoplifting policies and procedures to protect their store against theft. 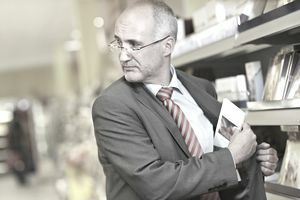 In order to stop a shoplifter, retailers must first be familiar with the categories of shoplifters, common shoplifting methods, and know what to look for in customers who exhibit strange behavior. Here is a more in-depth article on how to spot a shoplifter. But the main things to consider are visual cues. Most shoplifters use items to conceal their theft. There are those rare occasions when a thief will just grab and run, but that is not very common. Most have a plan for how they will remove the merchandise from your store. For example, a long coat in the middle of summer provides a great place to conceal merchandise. Female shoplifters often carry more than one handbag or purse. A purse is not something that catches your eye so it makes sense. However, more than one is unusual. Other places thieves tend to hide merchandise may include strollers, clothing, umbrellas, even inside bags with items they paid for. Paying more attention to the employees than the merchandise. Picking up random items and "pretending" to look at them. Walking the opposite direction of employees. Each time you move, they move. If you are an apparel store, watch the number of items they take into the dressing room and check that count when they exit. One of the most effective tools to prevent shoplifting is good store management. Retailers should also use store layout, adequate inventory controls and follow common security practices to combat shoplifting. Try to minimize the number of "hidden" places in the store. In other words, a place where an employee cannot see what a customer is doing. Not only is it a bad idea to block all views for shoplifting, it also impacts your ability to service. And speaking of service, the best way to prevent theft is through proactive service. If an employee is actively engaged with a customer, then it is very hard for the thief to steal. He or she knows they are being watched. Use customer service to prevent shoplifting, it's your best weapon. Keeping your store merchandised well is a big help in the fight against shoplifting. If you have disorganized shelves, how would you know someone stole from you? Empty space on a shelf or display table should be a big signal something is wrong. But only if you are focused on merchandising. It is important to plan store policies and procedures for shoplifting early in the business planning process. You hope it will never happen in your store, but the truth is - it will. And when it does, retailers and their staff should be prepared to handle the situation. Take the following into consideration when writing your shoplifting policies. How do you approach a customer you suspect? How do you confront the suspect? or Is your policy to not confront? Who do you call or contact? Make sure that you take time to role-play with your employees on the proper procedures. This is not something they should "shoot from the hip." Train them well. Retailers are constantly struck by outside influences out of their control. And the truth is, the overwhelming majority of shoplifters are not professionals. But you can control your methods of loss prevention. Preventing shoplifting, stopping employee theft and reducing shrinkage can help ensure the retail store is keeping the most revenue possible.